[September 30, 2014] You don’t need to run, jump or spin to get a great calorie-blasting workout. Just ask Diana Oliver. After gaining a staggering 100-plus pounds with two closely-spaced and complex pregnancies, she peeled off the pounds with urban poling. Haven’t heard of it? Urban poling is the contemporary version of classic European Nordic walking – think cross-country skiing without the skis. Oliver’s story doesn’t surprise Mandy Shintani, an occupational therapist and managing director of Urban Poling Inc., a Vancouver-based company that designs and manufacturers Nordic walking poles. “Research shows that urban poling burns up to 46 percent more calories than standard walking because it uses 90 percent of the body’s muscles, including the arms, core and back muscles,” says Shintani. Researchers have also discovered that when people move from regular walking to urban poling, they move faster, more frequently and for longer distances. As for Oliver, she says that regular urban poling combined with healthy eating has been her lifesaver. 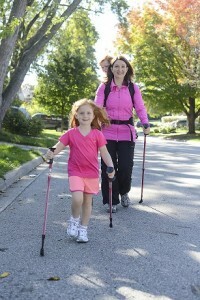 She is currently a certified urban poling instructor and recently became a partner in Urban Poling Inc. It targets your core – Unlike walking with hiking poles, urban poling uses a ‘plant-press-propel’ technique that strengthens the core and upper body and turns walking into a full-body workout. It burns mega-calories – Research proves that the multi-muscle activity turns up the calorie burning by 20–46 percent when compared to standard walking. It is kind to knees and hips – Using the poles properly shifts weight from your lower body joints and back and into your upper body enabling you to walk further, faster and even pain-free. You’ll say good-bye to slouchy posture – The upper back muscles (that pull your shoulder blades together) tighten and strengthen with each urban poling arm swing. Instructors are everywhere – Urban poling isn’t difficult to learn, but most people need a lesson or two to master the arm swing, posture and rhythm that are required to reap all the benefits. Vancouver-based Urban Poling Inc. distributes and designs five styles of high performance Nordic walking poles, all with ergonomic and easy-to-manage strapless handles. It is the largest Nordic walking pole distributor in Canada and offers the only Nordic walking instructor training program recognized by Canada’s largest nine largest fitness and health organizations. It sells its products through retailers and online and has certified 2,500+ instructors. For more information visit www.urbanpoling.us. Contact us for more high quality photos.